Turning out a perfect roast involves a number of tradeoffs for the cook. High-temperature roasting produces lots of browning, which means lots of flavor, but it tends to toughen and dry out your roast. That's especially true of small and lean cuts, such as a pork loin. Low-temperature roasting keeps the meat tender, but produces little flavor. 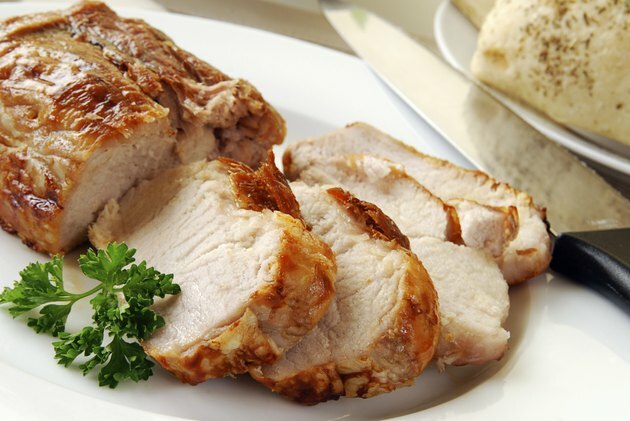 Using a convection oven for your pork loin provides a middle ground, giving excellent browning at even moderate temperatures. Trim the fat cap on your pork loin with a sharp knife, reducing it to a very thin layer over the surface of the meat. Score it into a crosshatch or diamond pattern with shallow strokes of the knife, taking care not to cut into the meat itself. This helps the fat render out, leaving just a thin, brown crust at the end of the cooking time. Set your oven to convection mode, and position a rack in the top third of the oven. Preheat it to 350 degrees Fahrenheit. Season your loin roast to taste, and place it on the rack of your roasting pan. The rack keeps your roast above its drippings, so it won't absorb fat from the bottom of the pan as it cooks. Season your loin roast to taste, and place it on the rack of your roasting pan. The rack keeps your roast above its drippings, so it won't absorb fat from the bottom of the pan as it cooks. Slide your pan into the oven. Roast the loin at 350 F for approximately 15 minutes per pound, until it's well-browned at the surface and an instant-read thermometer inserted into the middle of the roast reads 145 F.
Remove your loin from the oven and let it rest under a loose covering of aluminum foil for five minutes before serving. The convection oven speeds cooking by using a fan to blow hot air across the roast. This dries the surface rapidly by evaporation, enabling the roast to begin browning much sooner and more thoroughly than it would in a conventional oven.